Whether in business, management, society, or politics, it seems at times that we are surrounded by battle lines, waging price wars, detecting threats, forming alliances, and aiming to conquer the market. People in positions of responsibility in business and society have developed a fondness for war rhetoric. But is fighting the only solution to a conflict and in tough competitive situations? Destructive interaction wastes resources and only yields losers in the end. Diplomats can show the way down different path. With clear messages, elegant expression, and consideration for people, they understand how to advocate their views, to break deadlock in negotiations, to take the sting out of bad news, and to focus on human crisis management when relationships hang in the balance. In The Art of Winning Gently. 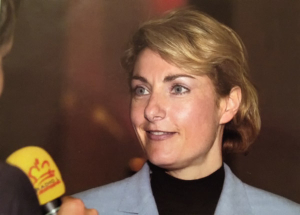 Diplomacy for Success, business pioneer and leading diplomat Gerlinde Manz-Christ advocates a less aggressive form of competition and respectful interaction at all times – no matter how important individual roles may be, how crucial the talks, and how desirable the objectives. She explains how to uphold legitimate concerns in a way that can also benefit the other party, allowing people to save face if concessions have to be made. In her view, the business world is not a war zone where victory should be gained at the expense of the other, but a marketplace where negotiations for the common good should always be fair and on equal terms, even if they are extremely difficult. The author has a very individual way of conveying her message. She uses a fascinating range of diplomatic experience at the highest level to directly engage the reader in dialogue. She provides a thrilling look behind the scenes in places where power is concentrated, telling intriguing stories about encounters with exceptional people and bringing the fascination of foreign cultures to life. In a narrative like no other, she guides the reader through a chapter of history, personifying a new spirit of communication as she goes – an approach in which success is shared by all in preference of short-term victories where the winners may find themselves on the losing side a short time later. The Art of Winning Gently is a unique volume on communication that eschews the typical techniques and methods contained in handbooks that aim to provide readers with tools and checklists to defeat others. It makes the case for a new culture of respect, founded on a genuine concern for other people. … or in well assorted book stores. 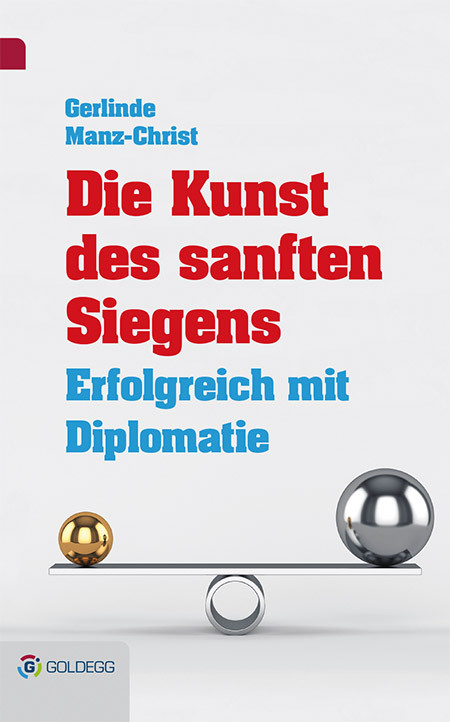 Die Kunst des sanften Siegens. Dr. Gerlinde Manz-Christ is a diplomat, business expert, and gefragte keynote speaker. She holds a doctorate in law. After many years working for the Austrian diplomatic service and most recently serving as head of international communications and government spokesperson for the Principality of Liechtenstein, Dr. Manz-Christ is now passionately dedicated to business and political diplomacy. She brings together the art of diplomacy and the needs of the corporate world. Dr. Manz-Christ is also a lecturer at institutions such as the University of Innsbruck and the Diplomatic Academy of Vienna. Order a signed book copy. Order a signed book copy here now! Mrs. Manz-Christ, why do you think it’s time for a new culture of communication in society? If you look at business, politics, and society, you can see that the language being used is increasingly brutal. For example, war metaphors are used to describe ordinary relationships, and people have lower inhibitions when it comes to intruding the space of others with words. Given that communication is the central element of interactions between people, carelessly chosen words often damage relationships to some extent. Even if you apologize, you can never take back what has been said. Imagine a broken vase that has been stuck back together. No matter what lengths you go to, it will never look the same again. The same is true of a relationship that has sustained “verbal damage.” If you’re running a business, it will cost you money. If you’re a party leader, it may harm not only your supporters, but every citizen in the country. What impact does this have on people who make a name for themselves in the communicative sphere and have to live in it from day to day? Prominent names in politics, business, and society always act as role models for individuals – although they are often negative role models, unfortunately. Given their influence, they can be seen to legitimize disrespectful relationships between people. At an individual level, you do not even have to be a supporter or a fan to follow a false ideal. It is enough to be confronted with a lack of respect every day in the media and in business, believing that such verbal jousting is normal. As a result, communication gradually shifts, often unnoticed, until the damage is finally revealed – by which time it is difficult to correct. How important are digital media in this context, would you say? Extremely important. In principle, new media are fine when used in good measure, complementing analog communication rather than taking its place. At the same time, the basic rules of politeness that govern personal contact should also exist online. I believe that is rarely the case these days, though. The decline in polite language is faster online than in the real world but also reflects the latter. It is a dangerous downward spiral. In your book The Art of Winning Gently, you talk about a “digital diet.” What do you mean by that? Are our lives too digital? For me, a digital diet means using digital media in a meaningful, considered, and healthy manner. In practice, this means quality over quantity, moderate and judicious use, and most important of all a combined approach that also entails personal communication. Only in that way can such media have a genuine impact. Less is definitely more on this front. By working with less, I can really focus on the content and create added value for myself and for others. There is no other way to make digital media a valuable dimension of my private communication or an effective tool in my business life. If we allow digital media to become an end in itself, many people will feel inundated with spam and click away from important messages in a hurry. If such messages are always accompanied by a coarse style, a pervasive lack of standards in the digital world will lead to inner numbness and the degradation of key social rules. In companies, I work together with senior managers to develop a personalized “digital diet strategy” that combines the best of both worlds – analog and digital. Such strategies contain a mixture of basic forms of human interaction – statements, responses, eye contact, and verbal and nonverbal communication – together with modern, effective, and efficient communication tools that connect people and build on a foundation of trust and credibility. 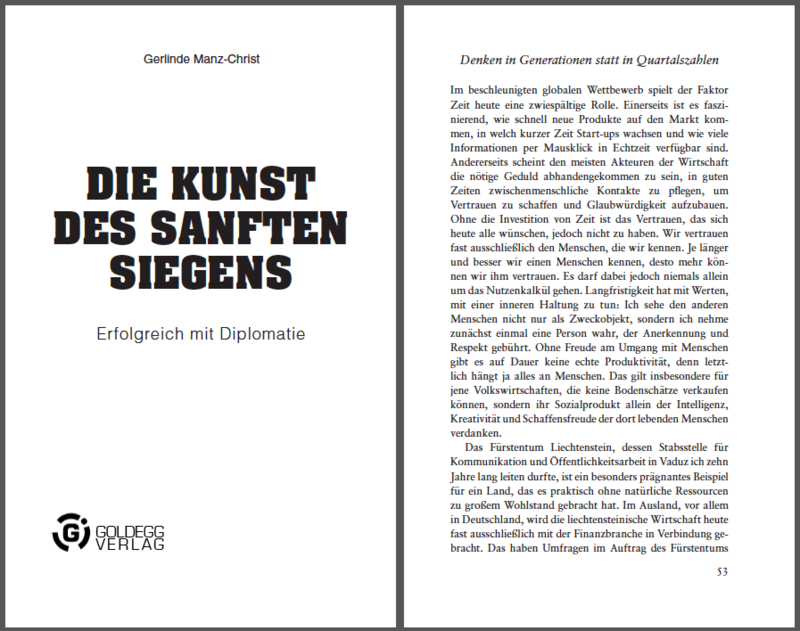 The full title of your book is Die Kunst des sanften Siegens. Erfolgreich mit Diplomatie [The Art of Winning Gently. Diplomacy for Success]. What is your goal? Aren’t there already enough books out there about communication? There can’t be too many books that help people to talk to each other better and to communicate more effectively. It is impossible to imagine human existence without communication. In very broad terms, I understand communication as dealing with each other. A community that adopts a basic attitude of goodwill promotes high quality of life, wellbeing, and health – exactly what so many people are missing in companies and other organizations these days. In some cases, this can make them very ill, emotionally or physically. Following on from this idea, my book does not provide a box of tricks to force or persuade people to arrive at a consensus that benefits us a little more than our counterparty. This is what many handbooks offer in order to attract readers. In The Art of Winning Gently, I describe a basic inner attitude of respect toward others – an attitude that protects my communication against deliberate attacks or accidental criticism. For me, respect is at the start of a path that leads directly to emotional awareness, or rather emotional awareness is at the start of the path because everything else depends on that. Although everyone is capable of feeling compassion, an individual’s personal development largely dictates whether this ability is fostered and put into practice. In these fast-paced times, people tend to focus on improving their own position, and I often sense a lack of emotional awareness. In many cases this can lead to a lack of respect and inappropriate communication. This is a trend I hope to tackle. Does that mean that respect will naturally lead to more attentive communication? Isn’t the society we live in geared toward securing victory over others? That all sounds very nice and desirable at first, but wouldn’t the wolves just eat the sheep in the world you describe? That makes it sound like it is foolish to be respectful and kind or to show understanding for other people in negotiations. That is not at all the case, though – on the contrary. In our highly networked world, long-term success is hardly possible without others. Of course you can choose to mow people down with words and best them in business. However, success of that kind will not last once your reputation gets around. In the long term, those who triumph follow the rules of the community and do not see others merely as a means of maximizing their own success. Furthermore, the subtitle of my book is Diplomacy for Success. When many people hear the word “diplomacy,” they mistakenly think of softies who like to beat about the bush. The truth is quite the opposite. Diplomats can say things very clearly. They have to, in fact, and this comes naturally to them. However, they prefer to strike a formal tone – elegant and amiable. After all, if you hope to get someone on your side, there’s no point in being offensive or alienating them, especially if getting them on board calls for a significant concession. Only if you understand what motivates others, take their concerns seriously, and see the person behind your opponent can you hope to create a world in which everyone is a winner – including yourself. That is the kind of approach I advocate.